Dante's Premium Hemp Oil is an innovative THC-free CBD supplement developed specifically to support the overall health and wellness of dogs, cats, horses, and other animals. This straight-from-nature product for pets blends CBD oil with MCT oil for an easy to pour, easy to measure daily CBD supplement. 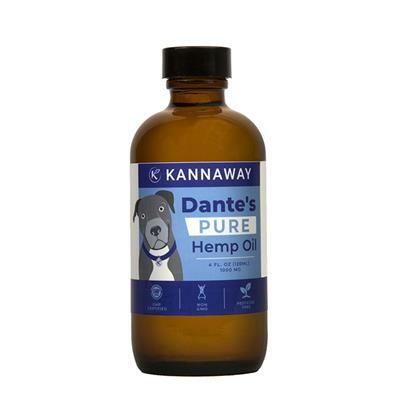 Every 4-ounce bottle of Dante's Premium Hemp Oil contains 1000mg of CBD, and because it is THC-free, this CBD hemp oil supplement will not cause a euphoric effect in your animal and is well tolerated in animals large and small. Kannaway partnered with leading veterinarians and CBD experts to formulate a CBD product that safely helps your dog, cat, or horse maintain their health throughout their lives. An all-natural alternative to the chemical-based products often given to pets, it can be easily placed directly under your pet's tongue, its light hemp flavor mixes in well with their favorite foods and treats. With Dante's Premium Hemp Oil, you can rest assured you are providing your animals with the best THC-free CBD available today. Safe use in pregnant animals or animals intended for breeding has not been proven. If animal's condition worsens or does not improve, stop product administration and consult your veterinarian. Federal law prohibits the off-label use of this product in ruminants. For ANIMAL USE ONLY. Do not use if seal is broken. In case of accidental overdose contact health professionals immediately. Keep out of reach of children and animals.